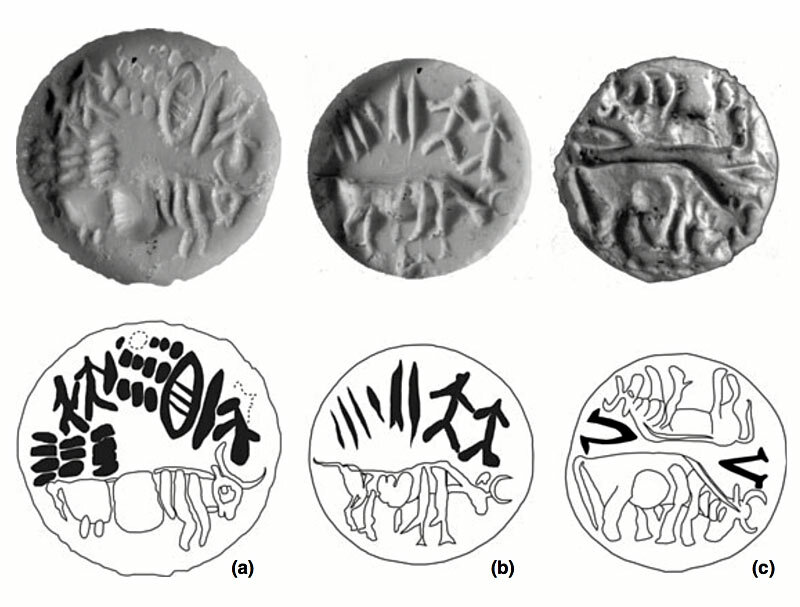 A very interesting paper by Steffen Terp Laursen, an expert on Dilmun, or the civilization in Bahrain contemporaneous with the ancient Indus civilization, suggests that the round, so-called [Arabian] "Gulf seal", often found with Indus signs and creatures like the short-horned bull and standard, developed from ancient Indus seals and representatives moving westward. Later these types of seals followed their own development trajectory and their Indus iconography. The westward transmission of Indus Valley sealing technology: origin and development of the ‘Gulf Type’ seal and other administrative technologies in Early Dilmun, c.2100–2000 BC is a fascinating example of how, once again, very careful analysis, indeed microanalysis of even small objects like seals, can indicate different styles and traditions that speak to larger issues like different maker communities or craftsmen. They shed light on how a technology and style moves across place and time, changing along the way to fit a different cultural equation. It also reinforces the great likelihood that seals in the ancient Indus, just like in neighbouring civilizations in Mesopotamia and Dilmun with whom Indus traders interacted, were primarily economic instruments. Laursen writes of the Gulf seal, which "come from a vast geographical area encompassing Bahrain, the Indus Valley (Mohenjo-daro and Chanh-Daro), Iran (Kerman, Luristan, Susa and the eastern Iranian plateau), Kuwait (Falaika), Mesopotamia (Ur, Girsu, Babylon and others unspecified) and the U.A.E. (Tell Apraq)," that "the Indus inscriptions on the seals are investigated with particular emphasis on the abnormal occurrence of prefixed ‘twins’ signs in the western inscriptions. 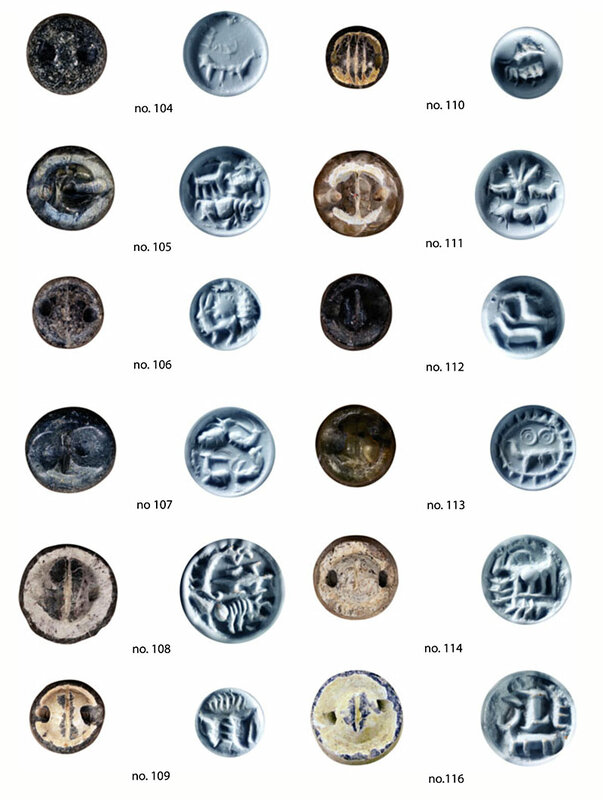 The hypothesis that a language different from that of the Harappans was used on these seals is reconfirmed on the basis of a newly found seal with a particular instructive pseudo-inscription. The writer "concludes that breakaway Harappans operating in the western orbit invented the Gulf Type seals but that the type from around 2050 BC became practically synonymous with the merchant communities in Dilmun." The paper lists all of the Gulf seals found, including a number of new ones, and meticulously goes through the research, the facts known about them and how this could fit into the political and economic trajectory of the area. Laursen is the co-author of the forthcoming (this month!) Babylonia, the Gulf Region and the Indus, which looks like it will be a new, comprehensive study of the evidence around Indus contacts with sister civilizations.